The Harry Potter series has so many fantastic characters that it's hard to pick one to feature. 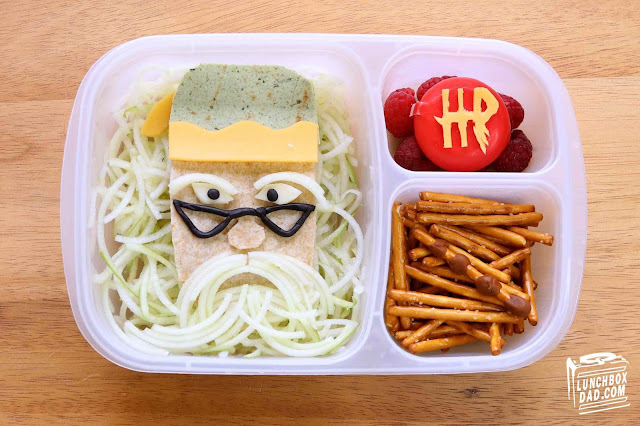 The good news is that both of my older kids love it so it gives an endless supply of ideas for lunches and special treats. 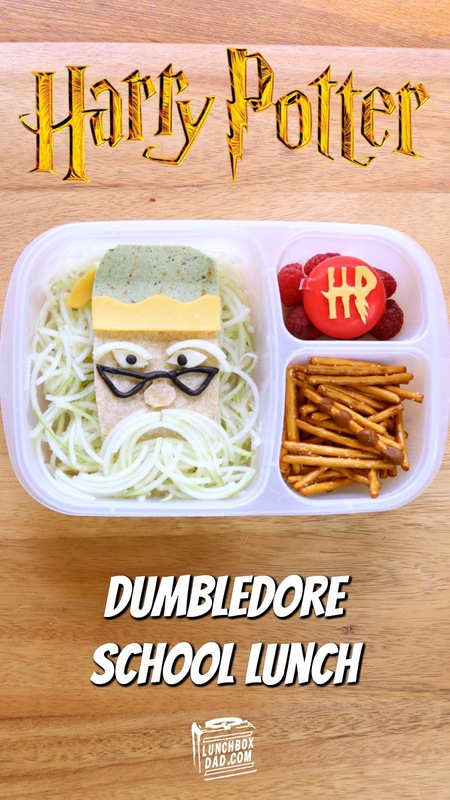 For today's lunch I wanted to highlight Dumbledore because he is such an interesting part of the series. I wanted to show his fierceness and wild side that he exhibits when the situation calls for it. While he has a soft side for Harry, Hermione, and Ron, he is always quick to step up and lead. I hope my kids remember how important that is when they are faced with tough decisions at school. Maybe this lunch will help! 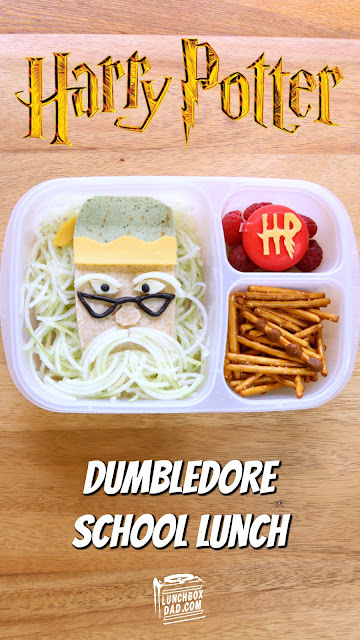 I created it in an Easy Lunch Boxes container and also made a video showing how I put Dumbledore together. Watch the video first, and then check out the recipe to see the ingredients and how I made the rest of the lunch! 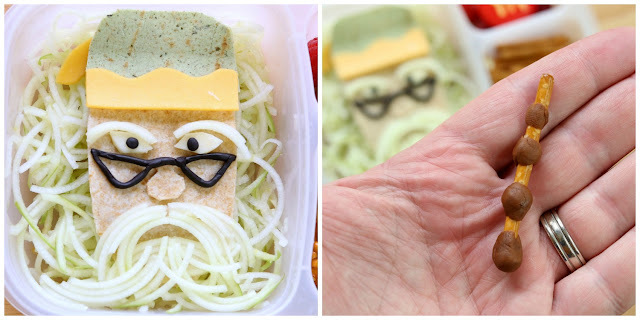 Dumbledore Ingredients: Spiralized apple soaked in lemon juice for hair, whole wheat tortilla for face and nose, cheddar cheese for hat details and inside the sandwich, salami inside the sandwich, spinach wrap for hat, white cheese for eyes, black fondant for eyes and glasses. Ingredients for the side compartments: Raspberries, Babybel cheese, cheddar cheese, pretzel sticks, brown fondant. 1. Drop raspberries in side compartment. Place Babybel cheese on top. Cut "HP" logo from slice of cheddar cheese and put on top of Babybel cheese. 2. Arrange pretzel sticks in second side compartment. Stick fondant to one pretzel stick as shown to create Dumbledore's wand. Place on top of other pretzel sticks.